One controlled cache which is blue. Background is blue which is the zone control color. There seems to be an overlap of dragonZones near Whyalla in South Australia. 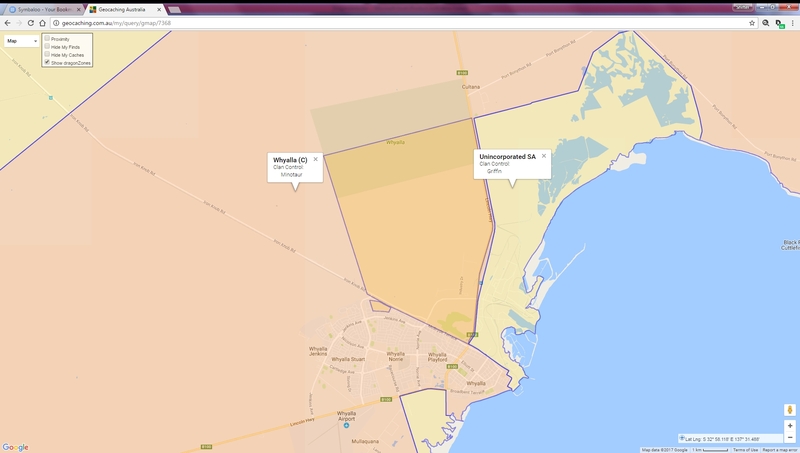 There are two locations where Whyalla (C) shares the same space as Unincorporated SA, as can be seen below. I'm sure it doesn't affect any GCA caches, and I can't imagine it'd be easy to fix, so just making the issue known. I was just looking at my trophies and noticed that although I have a Bronze trophy for hiding a single night cache as part of the scavenger game the silver count is at 10 instead of the 9 I was expecting. Is this a fault in the counting for this particular trophy or something else I'm not seeing. Thanks for bringing this up. It was a bug which has been squished. As this is a dZ bug you get some dZ points for finding it. Enjoy. When I open http://geocaching.com.au/my/dragonzone/# I used to see the map and list, but since it has been tucked up into an expanding menu thingy, it will not open. I click the link and nothing happens. This only occurs when using Chrome, but the map and list expand as expected when using Firefox. I do use the Disconnect extention in Chrome, but even white-listing the site doesn't change anything. Sorry, that's an issue at your end. I develop and test (and at home use) Chrome and it all works for me. It also works for me using Chrome on my tablet. Does the menu and the footer expand on that page when you're there? Try hitting CTRL-F5 or SHIFT-F5 to force a refresh of the style sheet. Hitting CTRL-F5 did the trick. Everything's back as it should be. The code is fine. Most likley the transaction got stuck and was applied twice. Enjoy the bonus. Yep, only 3.5 points for one day I know, but just wanted to check that all was good with the system. I take it the areas are just imported and there is not a lot we can do about it, but wanted to raise it as it's been nagging at me. With Tassie having more coastline than most other states i'm not surprised TBH and happy to put it down as one of those things but equity would like a reply clarifying the situation.